Well. I have totally gone of the tracks. The train is still moving, god knows where, how and when--but I am in a portrait automatic writing moment. And, with Rob gone, I have an hour or two to knock these babies out. Quick is the theme...not over articulating things (like the portrait of Kitty or the black and whites of the glass artists I have done)--but quick, deliberate and yet not abstracted. Yet. That's the next step. I need to eat and drink portraits--which is what the two weeks at The Hartford Art School promises with one week on a digital project with Jean Tuttle and Nancy Stahl, the other with Gary Kelley and CF Payne. My teachers from the web, from books and from the current world of illustration include the wonderful and inspiring Pablo Lopado from Argentina; Philip Burke--neighborly from Buffalo; The remarkable portraits of Holbein; the same from Hirschfield and Steve Brodner. This is just the front of the work. I want to start stretching the drawing...the color, the simplicity. Who knows where this path will take me. I am hoping to do one portrait a day to push the speed, the brevity, and making it a more natural experience. 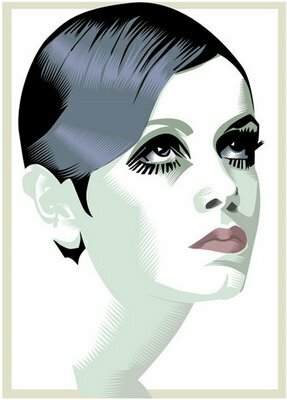 Somehow I am loving glamourpus gals...Diana Ross, Twiggy...maybe Jean Shrimpton and Sophia Loren. They are all eyes and teeth. And, lets not forget about the hair. Kitty and I had a time in the Trader K basement getting some sundresses...amazingly pretty things for pocket change. Alex and she are going to a party tonight..."come dressed as someone from Fiction. Kitty is going as the Great Gatsby's Daisy. We bought Alex a remarkable double breasted suit that fits him to the tee...cuffs, length--whole shot from Petrune, a vintage store on the Ithaca Commons that Dominica Brockman and her totally smart and stylish husband run, buy for, inspire. Dominica liked Kitty's ripped tee (with a heart ripped on the back)--and was interested in carrying Kitty's work. She also loved Kitty's necklace. I don't know how to kick K in the behind...cause its fashion, its creative and her work. I would be SO charged. She is pretty nonplussed. Oy. Alex is set. He is going as Gatsby. We saw new Cole Haan loafers (his size, NEW, and black) at Trader Ks ($18. ), they fit...and he POOHpoohed them. Bring on the flip flops or the ripped converse sneakers. We sat outside and had a very grown up sushi lunch (which K and A adored) after picking Kitty up from the ACT test. This was very positive for K after two shots at the SATS. We will see. Rob is busy being a leader of the Glass conference in Corning. Too bad the weather is not cooperating (rainy now).